The root of the perennial herbaceous plant Ophiopogon japonicus (Thunb.) Ker-Gawl. of family Liliaceae. 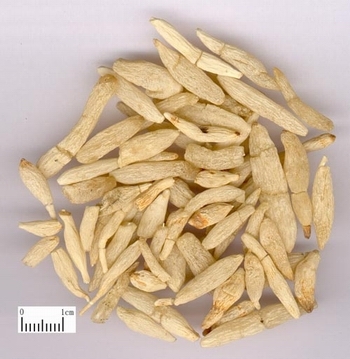 Mainly cultivated in Sichuan, Zhejiang and Jiangsu provinces in China. Plucked in summer and autumn. Solarized repeatedly and piled until dried, clear hairy rootlets. Slightly fragrant smell, slightly sweet astringent flavor. Plump, soft and light-yellow cover. Sweet, slightly bitter, slightly cold; stomach, lung and heart meridians entered. Nourish yin of stomach, lung and heart, clear heat of stomach, lung and heart, calm heart and induce tranquilization. It is indicated for dryness in mouth and thirst, pain in stomach and abdomen, hunger without appetite, retching, dry stool or constipation and other symptoms due to stomach yin deficiency with heat, because it can nourish stomach yin, clear stomach heat, produce fluid and moisten intestine. It is usually combined with yin-nourishing, fluid-producing and symptom-suiting herbs. For dryness in mouth and thirst due to stomach yin hurted by heat, or slight pain in stomach and abdomen, hunger without appetite due to stomach yin deficiency with heat, it is combined with Sheng Di Huang, Yu Zhu and Sha Shen in Yi Wei Tang from Wen Bing Tiao Bian. For consumptive thirst, it is combined with fluid-producing and thirst-relieving herbs, such as Wu Mei. For vomiting due to qi ascending caused by stomach yin deficiency, it is combined with stomach-harmonizing and vomiting-relieving herbs. For instance, it is used with Ban Xia in Mai Men Dong Tang from Jin Kui Yao Lue. For dryness in intestines and constipation due to fluld hurted by heat pathogen, it is combined with fluid-producing and intestine-moistening herbs. For instance, it is used with Sheng Di Huang and Xuan Shen in Zeng Ye Tang from Wen Bing Tiao Bian. It is indicated for dryness in nose and throat, dry cough with lirtle phlegm, hemoptysis, pain in throat, and hoarseness due to lung yin deficiency with dryness-heat in lung, because it can nourish lung yin, moisten dryness in lung, clear lung heat and relieve sore throat. For dryness in nose and throat, dry cough with little phlegm or blood in phlegm, pain in throat, and hoarseness due to lung hurt by dryness pathogen, it is commonly combined with lung-moistening, clearing and symptom-suiting herbs, for instance, it is used with E Jiao, Shi Gao, Sang Ye and Pi Pa Ye in Qing Zao Jiu Fei Tang from Yi Men Fa Lu. For swelling and pain in throat due to yin deficiency wirh effulgent fire, it is combined with yin-nourishing, (fire-clearing and sore-throat-relieving herbs. For instance, it is used with Xuan Shen, Jie Geng and Gan Cao in Xuan Mai Gan Jie Tang from experience. It is indicated for restlessness, insomnia and dream-disturbed sleep, poor memory, palpitation due to heart yin deficiency with heat, because it can nourish heart yin, clear heart heat and calm heart and induce tranquilization. It should be combined with yin-nourishing and tranquilizing herbs, for instance, it is used with Sheng Di Huang, Suan Zao Ren and Bai Zi Ren in Tian Wang Bu Xin Dan from She Sheng Mi Pou. For restlessness and insomnia due to heart and yin aspect hurt by heat, it is combined with heart-clearing, blood-cooling and yin-nourishing herbs, for instance, it is used with Huang Lian, Sheng Di Huang and Xuan Shen in Qing Ying Tang from Wen Bing Tiao Bian.